8.1 Users Outside of the U.S.
We collect certain data from you directly, like information you enter yourself and data about your participation in courses and exams. We also collect some data automatically, like information about your device and location and what parts of our Services you interact with or spend time using. We may collect different data from you/about you depending on how you use the Services. Below are some examples to help you better understand the data we collect. Account Data In order to use certain features (like an online course), you need to create a user account. When you create or update your account, we collect and store the data you provide, like your email address and password. In addition, we assign you a unique identifying number (User ID). Course Data When you enroll in and take courses, we collect certain data including which courses, quizzes and exams you’ve started and completed as well as your exchanges with Wall Street Prep instructors and other users/students. Payment Data If you make purchases, we collect certain data about your purchase (such as your name and zip code) as necessary to process your order. You must provide certain payment and billing data directly to our payment processing partners, including your name, credit card information, billing address, and zip code. For security, Wall Street Prep does not collect or store cardholder data, such as full credit card numbers or card authentication data. The data listed above is stored by us and is associated with your account. We use tools like cookies, email marketing services and analytics services to gather the data listed above. Some of these tools offer you the ability to opt out of data collection. Functional: cookies that store functional settings (like the layout you've selected for viewing lessons or current promotions available to you). Session State: cookies that track your interactions with the Services to help us improve the Services and your browsing experience, remember your login details, and enable processing of your course purchases. These are strictly necessary for the Services to work properly. We use third-party browser and mobile analytics services like Google Analytics. These services use Data Collection Tools to help us analyze your use of the Services, including information like the third-party website you arrive from, how often you visit, events within the Services and usage and performance data. We use this data to improve the Services, better understand how the Services perform on different devices, and provide information that may be of interest to you. We use third-party advertising services like Google’s ad services to deliver advertising about our Services on other websites and applications you use. The ads may be based on things we know about you, like your Usage Data and System Data (as detailed in Section 1), and things that these ad service providers know about you based on their tracking data. The ads can be based on your recent activity or activity over time and across other sites and services, and may be tailored to your interests. Depending on the types of advertising services we use, they may place cookies or other tracking technologies on your device to collect data about your use of our Services, and may access those tracking technologies in order to serve these tailored advertisements to you. To help deliver tailored advertising, we may provide these service providers with a hashed, anonymized version of your email address (in a non-human-readable form) and content that you share publicly on the Services. We share certain data about you with training group leaders/instructors, administrators of organizations you are a member of, your employer, analytics and data enrichment providers, companies helping us run promotions or reviews/surveys, and advertising companies who help us promote our Services. We may also share your data as needed for security, legal compliance, or as part of a corporate restructuring. Lastly, we can share data in other ways if it is aggregated or de-identified or if we get your explicit consent. With Your Employer or Training Group Administrator: As many employers and university instructors or organizations use Wall Street Prep for coursework and training, we share your course, quiz and exam data including course completion and exam/quiz scores with employers/training group administrators/instructors who have signed you up for a Wall Street Prep account through a Service Agreement. With Service Providers, Contractors, and Agents: We share your data with third-party companies who perform services on our behalf, like payment processing, data analysis, marketing services, email and hosting services, and customer services and support. These service providers may access your personal data and are required to use it solely as we direct, to provide our requested service. With Analytics and Data Enrichment Services: As part of our use of third-party analytics tools like Google Analytics, we share certain contact information, Account Data, System Data, Usage Data (as detailed in Section 1), or de-identified data as needed. De-identified data means data for which we’ve removed things like your name and email address and replaced it with a token ID. This allows these providers to provide analytics services or match your data with publicly-available database information (including contact and social information from other sources). We do this to communicate with you in a more effective and customized manner. To Administer Reviews and Surveys: We may share your data as necessary to administer, market, or sponsor promotions and solicit reviews of products you choose to participate in, as required by applicable law (like to provide a winners list or make required filings), or in accordance with the rules of the promotion or survey. Reasonably necessary in our discretion to protect against imminent harm to the rights, property, or safety of Wall Street Prep, our users, employees, members of the public, or our Services. During a Change in Control: If Wall Street Prep undergoes a business transaction like a merger, acquisition, corporate divestiture, or dissolution (including bankruptcy), or a sale of all or some of its assets, we may share, disclose, or transfer all of your data to the successor organization during such transition or in contemplation of a transition (including during due diligence). We use appropriate security based on the type and sensitivity of data being stored. As with any internet-enabled system, there is always a risk of unauthorized access, so it’s important to contact us if you suspect any unauthorized access to your account. Wall Street Prep takes appropriate security measures to protect against unauthorized access, alteration, disclosure, or destruction of your personal data that we collect and store. These measures vary based on the type and sensitivity of the data. Unfortunately, however, no system can be 100% secured, so we cannot guarantee that communications between you and Wall Street Prep, the Services, or any information provided to us in connection with the data we collect through the Services will be free from unauthorized access by third parties. Your password is an important part of our security system, and it is your responsibility to protect it. If you believe account has been compromised, you should contact dpo@wallstreetprep.com with any concerns. For more, visit our Data Security Statement. To opt out of allowing Google Analytic to use your data for analytics or enrichment, see the Google Analytics Opt-out Browser Add-on. If you have any questions about your data, our use of it, or your rights, contact us at dpo@wallstreetprep.com. If a Wall Street Prep account has been set up for you by an employer, training administrator, academic organization or other organization, you must request account termination through that organization. 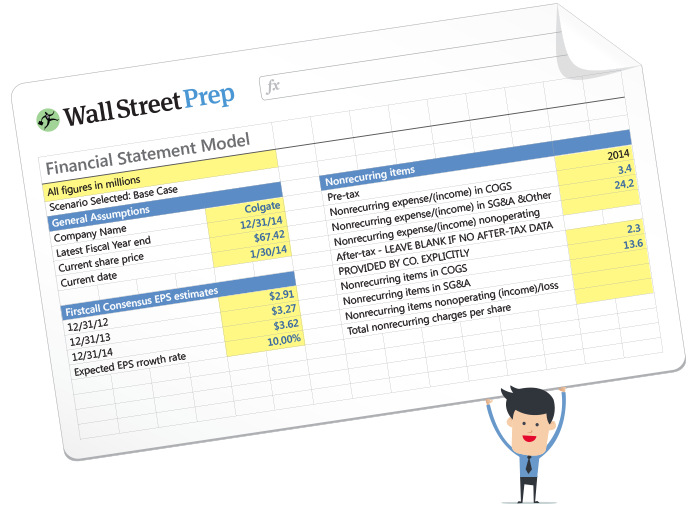 If you signed up to Wall Street Prep yourself through a form or a purchase, email us at dpo@wallstreetprep.com for account termination. To request to access, correct, or delete your personal data, email dpo@wallstreetprep.com. Please allow up to 5 business days for a response. For your protection, we may require that the request be sent through the email address associated with your account, and we may need to verify your identity before implementing your request. Please note that we retain certain data where we have a lawful basis to do so, including for mandatory record-keeping and to complete transactions. We recognize the privacy interests of children and encourage parents and guardians to take an active role in their children’s online activities and interests. Children under 13 (or under 16 in the European Economic Area) should not use the Services. If we learn that we’ve collected personal data from a child under those ages, we will take reasonable steps to delete it. Parents who believe that Wall Street Prep may have collected personal data from a child under those ages can submit a request that it be removed to dpo@wallstreetprep.com. Wall Street Prep, Inc. is headquartered in Massachusetts, and in order to provide the Services to you we must transfer your data to the United States and process it there. By visiting or using our Services, you consent to storage of your data on servers located in the United States. If you are using the Services from outside the United States, you consent to the transfer, storage, and processing of your data in and to the United States or other countries. Specifically, personal data collected in Switzerland and the European Economic Area (“EEA”) is transferred and stored outside those areas. That data is also processed outside of Switzerland and the EEA by our Wall Street Prep group companies, or our service providers, including to process transactions, facilitate payments, and provide support services as described in Section 4. We have entered into data processing agreements with our service providers that restrict and regulate their processing of your data on our behalf. By submitting your data or using our Services, you consent to this transfer, storage, and processing by Wall Street Prep and its processors. Cookies are small text files stored by your browser as you browse the internet. They can be used to collect, store, and share data about your activities across websites, including on Wall Street Prep. Cookies also allow us to remember things about your visits to Wall Street Prep, like your preferred language, and to make the site easier to use. We use both session cookies, which expire after a short time or when you close your browser, and persistent cookies, which remain stored in your browser for a set period of time. We use session cookies to identify you during a single browsing session, like when you log into Wall Street Prep. We use persistent cookies where we need to identify you over a longer period, like when you request that we keep you signed in. For example, cookies help authenticate your access to Wall Street Prep and prevent unauthorized parties from accessing your accounts. For example, cookies help us test different versions of Wall Street Prep to see which features or content users prefer, web beacons help us determine which email messages are opened, and cookies help us see how you interact with Wall Street Prep, like the links you click on.